The holidays are here! Are you planning to do a Whole 30 in 2019? 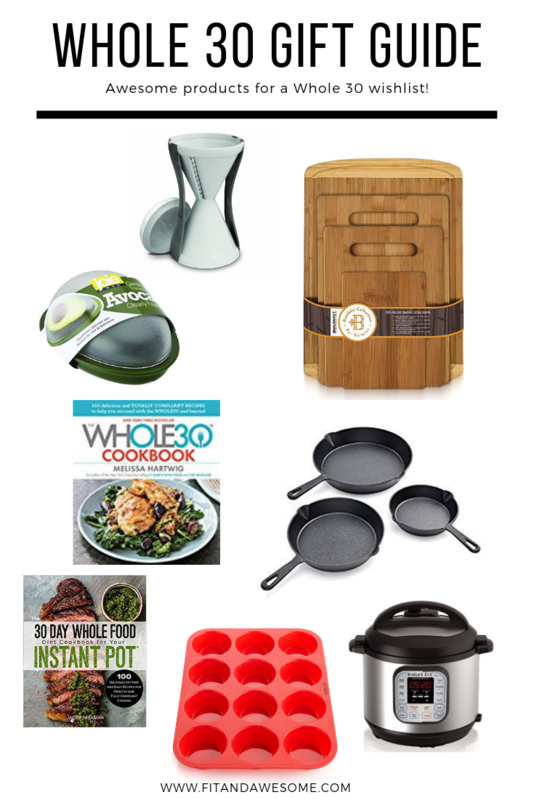 January is a great time to get started, and I’ve put together this Whole 30 Gift Guide for your friends and family who are starting their journey or looking for items to help support them in the process. Everyone usually has a New Year’s resolution to create a better lifestyle; live healthy, eat whole and exercise often. Whole 30 is a great way to kickstart a healthy eating plan, increase your energy levels, and make your body feel good. If you know someone who is in the midst of their Whole 30 journey, or finding the courage to start, share this gift guide with them. It’s a great way to help you and your friends accomplish your goals and learn how to make new, healthy, delicious food in your kitchen in the process. Veggie Spiralizer – I’ve got a Paderno Spiralizer, but this handheld spiralizer is on my list. It’s so easy to use and it’s the perfect stocking stuffer! Silicone Muffin Pan – I’ve done a review on my silicone muffin tray, here. I love it for making my Whole30 Egg muffins because they don’t stick to the pan. They pop right out! So much easier and no mess to clean up. This is a great item to have in your kitchen, easy to use, and easy to clean. Cast Iron Skillet – I got this Le Creuset Cast Iron Skillet a couple years ago and I love it. It’s great for cooking veggies and searing filet mignons. I love that I can sear the steaks and then stick the entire skillet in the oven. You can get a Cast Iron Skillet for as little as $12 (see here). Usually Amazon has great deals on these around the holidays! Instant Pot – You’ve seen me post about Instant Pot before, and they’re all the rage on social media. I love my Instant Pot for cooking shredded chicken, soups, and making delicious stews. It’s been a worthy investment for our family. Whole 30 Cookbook – I really like the Whole 30 Cookbook because it’s great to flip through and find new and easy recipes to make that the whole family will enjoy. I have found a lot of brands saying “Whole 30” on their cookbook when it’s not actually Whole 30 approved, but you can trust anything that comes from the official Whole 30 team. Cutting Boards – A good knife and cutting board is essential when you will be spending a lot of time prepping food in the kitchen. Having a nice, reliable cutting board is so helpful. Avocado Saver – This is a pretty goofy looking gadget, but it looks so useful and fun. A perfect stocking stuffer! Who are you shopping for? Let me know what is on your wishlist! Whole30 Day 29 Recap: Bring It On!